There’s something exciting about a group of women leading their own play in the West End; Our Ladies of Perpetual Succour is receiving an anticipated transfer and we’ve recently seen the stellar all-female Donmar Shakespeare season. It only makes sense that Stepping Out would be equally thrilling, but Maria Friedman’s revival of Richard Harris’ 1984 play is unflatteringly lukewarm. Amanda Holden gets the star billing as stuffy Vera, a whirlwind of bouffant and rubber gloves. She’s uppity, abrasive, but actually fairly endearing in her vibrant jazz pants. 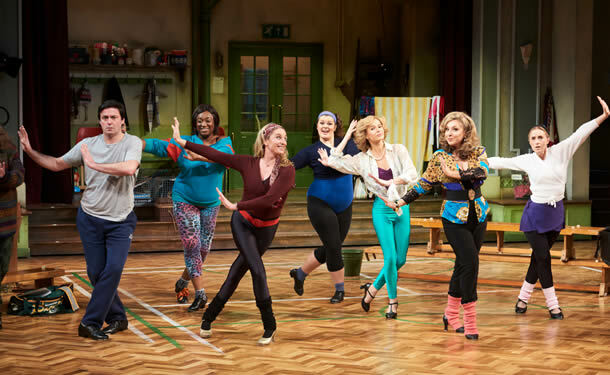 Tracy-Ann Oberman is also good as the vivacious Maxine, but Natalie Casey saves the ensemble with her hilarious, down-to-earth Sylvia. Otherwise, it’s all rather wooden. Technically, this is no fault of the cast. It’s just that there’s not much to Harris’ play, which barely fleshes out any of the characters. Mavis is dealing with a layabout boyfriend and unexpected pregnancy (revealed in one line and never returned to), Andy is struggling with suggested domestic abuse and Vera hints at an unusual relationship between her much older husband and daughter. These are quite dark themes, but barely touched upon in a strange attempt to keep everything as light and fluffy as possible. It doesn’t help that many of the jokes are outdated, at times verging on questionable. There isn’t much laughter for a comedy, besides giggles at things which potentially shouldn’t be funny. As the play goes on, you are aching for something to happen, but even the grand finale is unenthusiastic and undercooked, with disappointingly safe choreography from Tim Jackson. Fair enough, the ladies are good, but in this case they can only be as good as the material, which is tepid at best. It’s a shame, as there’s a talented ensemble and director at the centre of this piece. Maybe it needs a revolutionary update, or maybe there just isn’t much point in stepping out with this play.